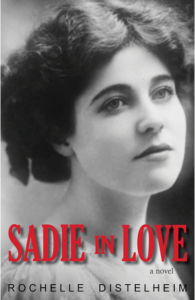 All this week, in the grand tradition of Victorian periodicals, Lilith will be serializing an excerpt of Sadie in Love, the debut novel from 90-year-old former magazine editor Rochelle Distelheim. Look out for new installments every day this week. Sadie Schuster—fortyish, plumpish, a suffragist, and recently widowed—spends more time now talking to her late husband, Fivel, than she did when he was alive. Sadie keeps Fivel informed of her daily activities—especially her pursuit of a husband—because “An empty bed is a cold place for a hot-blooded woman.” A lover of ballroom dancing, the moving pictures, and night-school English words, Sadie’s true talent lies in the magic love-knots she artfully crafts for lonely, unwitting, immigrants willing to purchase hope wrapped in a schmattah for fifty cents. Selling love-knots while seeking love, Sadie consults with her magic spirits to woo Herschel—the muscled ice peddler who reads poetry and pines for his newly departed wife. Her daughter, Yivvy, sells secondhand, possibly “pinched” tchotchkes in her antique shop and plans to marry the Irish cop on the beat. Enter Ike Tabatnik, the “Dance King of Riga, Latvia,” just off the boat and ready to take on America—and Sadie’s heartstrings. Comedy and chaos follow. A stunning confession, following the wedding of one of her love-knot clients—which begins with one groom and ends with another—pushes Sadie to make a surprising choice. She then throws herself at the mercy of her magic spirits, asking them to do quickly for her what they have been doing for her customers—before it’s too late. Fiction Editor Yona Zeldis McDonough talks to Rochelle Distelheim about what it feels like to have her debut novel published when she’s in her nineties. YZM: Tell us where the voice—and soul—of Sadie came from. 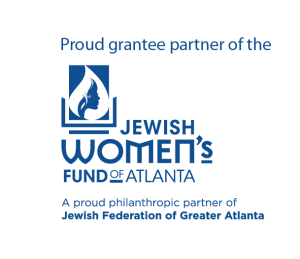 RD: They came from my own understanding of woman as object, including in tightly knit traditional early twentieth-century European Jewish Orthodoxy. When I could see her face, her flat, the street on which she lived, I would go where the voices are, the only way in which people who have never lived spring into life. YZM: How long have you been writing fiction? RD: Since sixth-grade grammar school. I wrote stories about my family, my friends, some that featured me as an American Indian child. YZM: You waited a long time to publish a novel—did you ever give up hope that you would see this one in print? RD: I wrote Sadie in Love 15 years ago, came close to selling it twice, to editors who asked for changes with which I didn’t agree, and once won second place in a contest. My husband offered to publish it himself, but I stubbornly continued to believe that Sadie’s story should be published by someone who could come to love her as deeply as I did. I was right. YZM: In addition to being a fiction writer, what other kinds of work have you done? RD My first career after finishing my degree at the Medill School of Journalism at Northwestern was as a freelance writer for women’s magazines: McCall’s, Ladies Home Journal, Glamour, Working Woman, Good Housekeeping. I flew all over the country covering everything from AIDS to the drama of being married to a police officer. When my babies arrived, I taught creative writing part time at Mundelein College in Chicago, if only to get into grown-up clothes and wash my face and get out for a full day. The nuns taught me patience; I taught them how to wear lipstick. YZM: Looking back to your own youth, what do you see as the most important differences between that time and now? RD: There are enormous differences, of course, too many to enumerate. One of which I am acutely aware is that, when today’s youth seeks change, he/she is likely to drum up collaborators, rent a corner somewhere, and make a difference. YZM: What’s the one thing you wish I’d asked but didn’t? RD: When you can buy Sadie in Love, and the answer is, it is now on pre-sale on Amazon, and will be released on July 30, 2018. Sadie knocked on Mitzi’s door at 4:01. She didn’t recognize the flat. Mitzi had furnished it like a scene from a fairy tale: gold brocade curtains, plaster statues of men and women draped in layers of filmy white tulle. The gas lamps were hooded with crimson, tulip-shaped glass, the mirror above the mantle framed in a circle of gilt angels busy hugging one another. And, in the corner — milky, luminous, shining like a skyful of moonlight, a piano. On Ludlow Street, a white piano, and she, she who missed nothing, missed seeing the men carry it in. Sadie hesitated. Maybe she should try, once. All the ladies who smoked in the moving pictures looked so, so — American. She shook her head. Mitzi tapped the cigarette on the case, lit it with a tiny ruby red lighter, and looked at Sadie with a half-smile that wasn’t smile enough for Sadie. “I came for advice,” she blurted out, and closed her eyes. When she opened them, Mitzi was all curves and draped chiffon, leaning against the cushions, smoking, looking more beautiful than Tootsie McCoy in her last movie, when she ran through the woods in a silver crown and white feathers. I can’t go to her for.” Mitzi’s beauty mark shimmered. That was the secret, beauty marks. “Anyway,” Sadie continued, hoping her pronunciation made up for her accent, and talked about being alone in New York without a mother, without a husband, who had married her when she was just eighteen, and not because she’d picked him or he’d picked her, but because someone back in Poland did the picking. “So, now I want to marry with someone I picked out myself, and I need help getting prettied up.” If Mitzi laughed, she’d raise her rent. Sadie knew that word, solution. She heard it from Lillian Pomerantz, the sweet-like-sugar school teacher who could gain a couple pounds, and maybe do something about all that curly black hair, not pin it down so tight, who talked better than anyone when she came to the library to say, shame on America, women can’t vote. Women had to stand up and holler, march around, remind the men they were just as good. Sadie stood up at one meeting and asked why that would work? Everyone marched around two years ago, after the fire in the Triangle shirt factory, so many young girls killed, and they forgot. Then Lillian Pomerantz said, in her soft, silky voice, pronouncing every word like she was born with a dictionary in her mouth, there was no easy solution, but they were making progress. Another high-class word. Sadie wrote it down, solution, adding it to her night school word list, and practiced in front of her mirror, loving the way the u, the t, the i-o-n- got worked into such a lovely shooshing sound. Sadie made a none-of-your-business face: maybe yes, maybe no. This was not the conversation Sadie had in mind. Talking to Gentiles was hard work. “Well…” She couldn’t talk about her marching ladies, and the vote, that wasn’t Mitzi, she could smell it. Better to get on to the love knots, even if Mitzi didn’t believe her, even if she’d say, like lots of people: You crazy, lady? Get out! “I make love knots.” Sadie’s hands crawled through her purse, pulling out a scrunched-up yellow and blue flowered knot. She shook it to restore its shape. “Meaning?” Mitzi crossed the room to a red lacquered breakfront, and brought out a crystal decanter and two glasses. “I don’t talk so good? I know a thousand fancy night school words, two thousand. Listen.” She took a deep breath. “Sumptuous, delightful, celebrity.” Should she tell her about the meetings in the library on Monday nights, the books, the pamphlets, the march they planned, women, only women? Sadie wasn’t sure how that was possible, but she loved the sound of it. The next installment of Sadie in Love will run tomorrow.